I love freezer paper. It's amazing stuff. 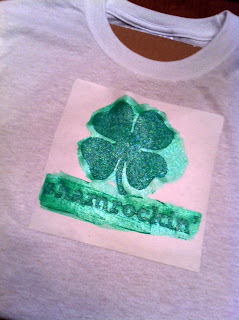 I saw the "pinch proof" t-shirts at Skip to My Lou and knew that I wanted to make the kids t-shirts for St. Patrick's day. I tried explaining what pinch proof meant to Vance and he just wasn't getting it, so I came up with my own design. 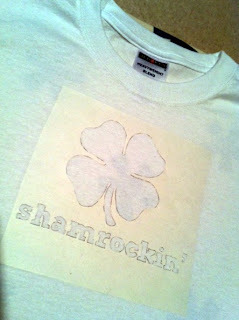 Here's the final t-shirt, drying. I'll have to update with a picture when it's ready to wear. 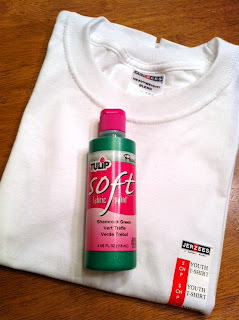 What you need: A t-shirt, Tulip soft fabric paint, a paintbrush, freezer paper, and an iron. Here's my drawing. Trace this onto the paper side of the freezer paper. Iron the freezer paper down onto your t-shirt, waxy side down, paper side up. Paint. Vance helped with this step. Make sure your coats are even and try not to glob it on. Be careful with the edges so you don't get any seepage. Overall, I was really excited about these. I did have one bleed through, but it's hardly noticeable. The kids chose the sparkly paint and I'm glad they did - it's fun! The paint is also soft and not stiff like the puffy paint that I used to use years and years ago. I'll definitely be doing more of these in the future. Oh, the possibilities!!! P.S. I did a quick one for Vaughn, just a simple shamrock. The store didn't have t-shirts that were her size, so this is just an old one from last summer. Happy (almost) St. Patrick's day! You still have time to make one! Great idea! We love St. Patty's day around here - well, any excuse to drink beer, really (don't worry, I already have my O'doul's in the fridge). I've been looking for a cute shirt for Asher but think it might just do something similar on a onesie. 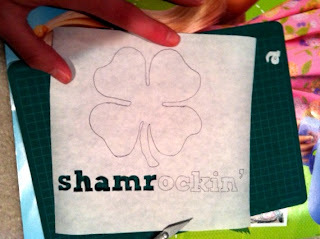 I'm not very crafty, so I'm sure mine won't turn out quite as great as yours, but I'm all for trying! Jen, you can do this! Asher needs one! If you do, let me know how it turns out! I love this shirt! And I'm with you, I'll take freezer paper and regular paint over puffy paint any day! Cute! Love the saying on the shirt, I hadn't heard that before! Visiting from Made by You Monday. Thanks everyone! Still time to make one! 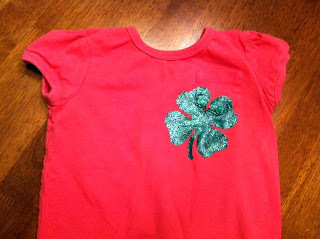 I bought Vaughn a white shirt today, so off to make one for her! That's a great idea. We will definitely use this idea next year. 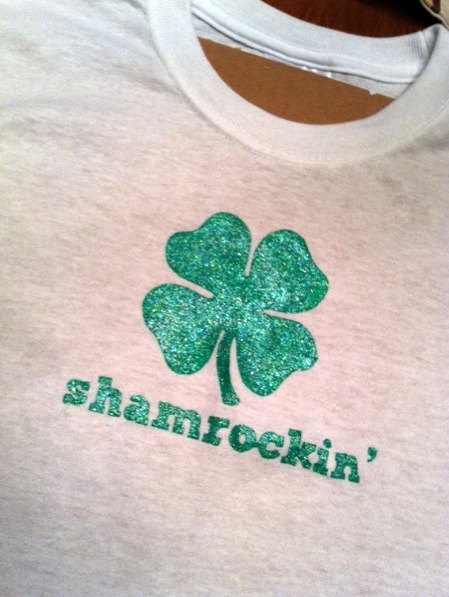 This year, we were in the (Detroit) Corktown St. Patrick's Day Parade with our MINI Club and we wanted to make something for our group so that we would look cohesive - I'll be blogging about what we did make a little later, but next year, we will make these!!! Great! Really, they're so easy! If you're cutting out by hand just make sure your exacto knife is super sharp. As long as your lines are sharp and you iron the paper down well you'll get a crisp looking edge. Hey, thanks Michelle! 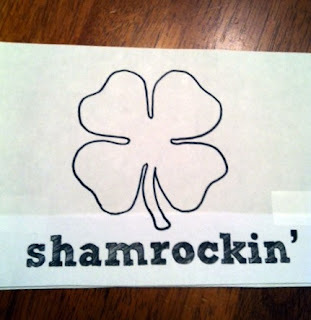 Don't wait until next year - freezer paper is fun all year round! Maybe a spring time design with pink and yellow fabric paint?! ?